We’d love your help. 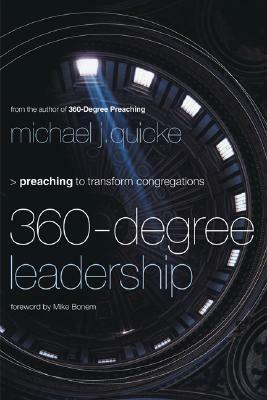 Let us know what’s wrong with this preview of 360-Degree Leadership by Michael J. Quicke. Leadership books and seminars notwithstanding, many pastors remain unclear on how to effectively lead their congregations. Some even believe that preaching needs to take a backseat to leadership. This book provides a call to pastors to allow biblical preaching to take center stage in the leadership of their churches. To ask other readers questions about 360-Degree Leadership, please sign up. Good book in that brings together preaching and leadership, unlike others, which I have never seen as separate. On the other hand, the book references and draws on so many other books, voices, & people that it becomes cumbersome reading at some points. one of the best books dealing with the preaching and leadership ministry of the pastor.